Space per pupil: 108 sq.ft. The vision of Cele Middle School began with a simple challenge: "Do It Better". 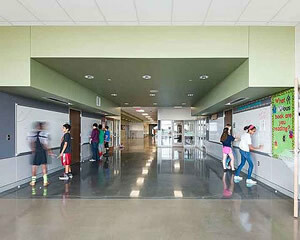 Pflugerville had utilized an SHW designed prototype for its five previous middle schools. 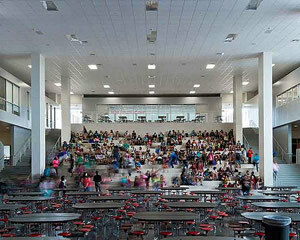 For its sixth middle school the district insisted upon increasing the capacity of the school by 300 students (from 1,200 to 1,500), without compromising what was a proven and efficient design, all within the same budget that had been assigned for a basic re-site of the prototype. The project team at SHW recognized that this was an opportunity to improve upon the previous design in virtually every measurable way. First and foremost the new design had to create a great place for children to learn. Secondly, the design had to improve upon the efficiency of the previous prototype. 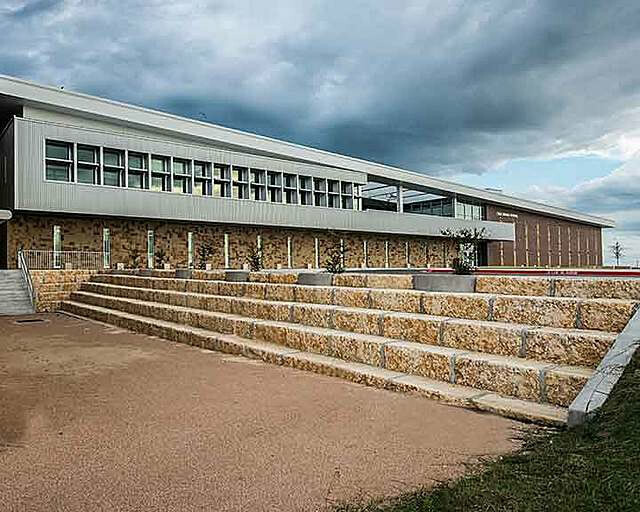 The architecture of the building promotes collaborative learning by providing spaces that create instructional opportunities not only within the classroom, but throughout the building and the exterior as well. 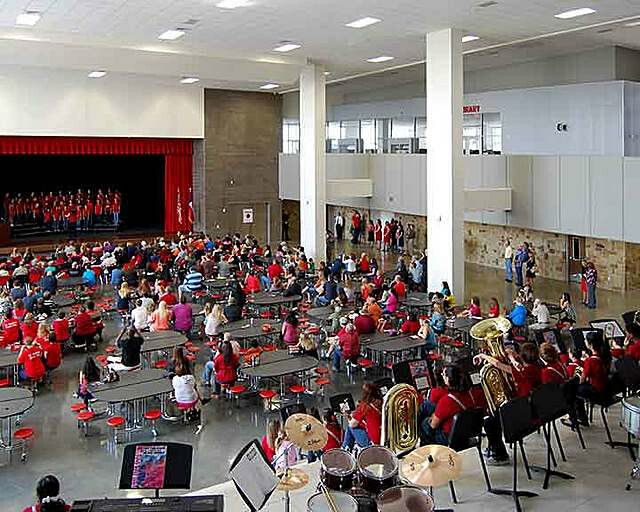 The flexibility of these spaces can accommodate student participation from individual and small group activities to large group instruction and presentation. Further, almost all of these spaces are equipped to accommodate hands-on use of the building’s technology infrastructure. The three level academic core of the building is designed to house grade-level small learning communities of 125 students each. 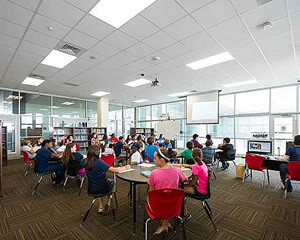 Classrooms for the core curriculum subjects are clustered in each small learning community around a common instructional breakout space that facilitates and encourages an integrated curriculum approach. The small learning community also permits each student to have a ‘home’ where they are familiar to each member of the teaching staff as well as the other students within their community. The large ‘learning stair’ that acts as a bridge between the academic wing and the building core provides a flexible space that accommodates a wide variety of functions: a social gathering space for students, large group instruction and presentation, expanded seating area for stage productions and activities, and student performance and exhibition space. This space has become so popular with the students that it could be described as the heart of the school. Staff workrooms and offices overlook the learning stair to provide passive supervision of student activities of the space and adjoining cafeteria. The three academic levels of the building are separated by a ½ level split from the core of the building. 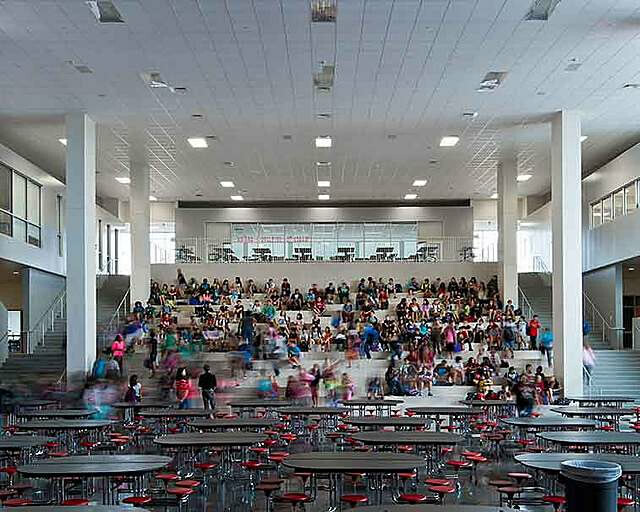 This allows the two lower grade levels (6th and 7th grades) to be physically closer to the building core, while the highest academic floor is only separated from the core by one and a half levels. The Library is located on the second floor of the core, accommodating equal access and reduced travel distance from each of the academic grade levels. 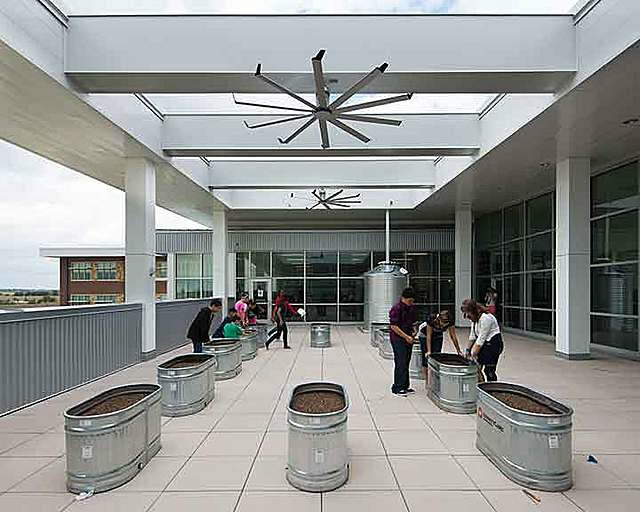 An outdoor ‘Roof Lab’, located adjacent to the Library, allows students to experiment with planter beds and the rainwater collection system. 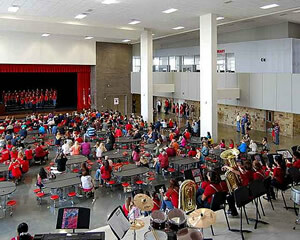 The cafeteria is located at the center of the building core and serves as both the dining hall and performance seating area for the stage, which is located directly opposite the learning stair. Performing arts instruction and rehearsal spaces wrap around the stage to provide direct access during performances, as well as direct access outdoors. The buildings athletic spaces are located at the southern end of the building. This allows the two gymnasiums to be entered into from the main building entry and allow direct access to the football/soccer/track complex from the student dressing areas. All of the building’s core spaces can be isolated from the academic wings to facilitate evening and community use without compromising building security. But, as previously mentioned, creating a great place for learning was only half of the projects objectives. The design also had to be more efficient than the previous prototype. To ensure this objective the design team utilized life cycle cost analysis to drive decisions for everything from mechanical and electrical systems to building finishes. 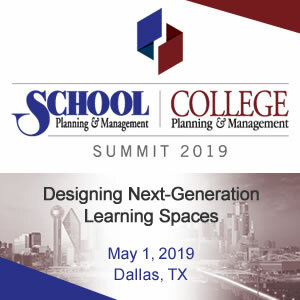 Utilizing these life cycle cost models demonstrated to the Owner the choosing the lowest initial price for these systems could cost the District significantly more than other options over the life of the building. Utilizing a geo-thermal HVAC system was not only cost effective on the initial investment but will reduce energy consumption and cost for the life of the building. The use of day lighting and day light control systems also reduces the amount of energy consumed without compromising the quality of the learning environment. In fact it improves it. One of the major objectives of the design team was to provide natural day light to every classroom within the building, a 67% improvement over the previous design. Daylighting and energy are further enhanced by properly orienting the building on a north south axis, allowing the building to better utilize daylight from the north and south and utilizing outside shading devices to protect from harsher east and west daylight conditions. Building finishes were selected that would reduce maintenance requirements and costs without compromising the durability and length of life demanded by their use. Polished concrete is used in lieu of VCT for flooring throughout the building dramatically reducing cleaning and maintenance time and cost. Likewise, interior walls utilize materials such as native stone, burnished CMU, and plastic laminate panel systems to eliminate the need for painting throughout the life of the building. The building design also directly contributes to the efficiency of the building. By stacking the academic areas of the building on three levels the length of circulation corridors was reduced significantly. Some of this captured space was utilized to create the learning community breakout spaces and the learning stair, but the remainder of the save space contribute to the condensed footprint of the building, which serves the further reduce energy use and maintenance cost for the school. Yet another feature of the design is how it is designed to serve as the District’s prototype for future schools. The plan of the building is essentially three large blocks: academics, core, and athletics. The configuration of each of these blocks can be rotated, or shifted to accommodate differences in orientation, boundary configurations, and topography of future sites without compromising the performance and efficiency of the concept. Cele Middle School has opened to rave reviews from students, staff and community members. Many of whom have described it as beyond what they could have envisioned a school to be. The story of the school is just beginning to be formed by the students who will learn there and the staff that will instruct them, but now you know how that story began.